Tonight I want to show you a marker I have been using for several years. I tried it at first on quilts that were small, in case something untoward happened. I kept track to see if there was any degradation of the fabrics, any discoloration, etc. After a couple years of okayness, I started using it more regularly, including my show quilts. When the quilting was finished, I steamed the top with my iron! You can see how all the marks are miraculously gone! Just remember to have all the quilting finished before steaming. I was quilting a black quilt with black thread and wanted to see what the quilting looked like without the white lines. After completing a good-sized section, I steamed that area. Unfortunately, the steam traveled outward and took out marks where I had not quilted. So I do know what I'm talking about here! This entire piece was batik--applique, top, backing, binding, sleeve. When I have the binding sewn down I will show it to you in its entirety. It will be my second finish to the year! 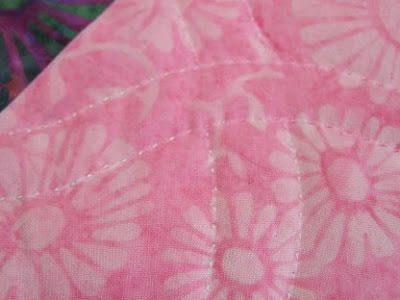 This photo just shows you a section of the applique and a bit more of the quilting. Also finished is the second sock of this pair! I am completely enamored of knitting socks! This is my plain vanilla cuff--K3 P1. Great TV knitting or travel knitting. Soft wool socks! They make your feet feel like they are having a spa day! The colors are richer than they appear in the pictures. So that's it for tonight. It feels good to be making a dent in the backlog. Plus I have several designs on paper--ahhh, decisions, decisions. Finish old stuff or start new and continue to add to the backlog! What a dilemma! Have I said recently how proud I am of my students? Well, Judy E. of Auburn, New York, really outdid herself this time. 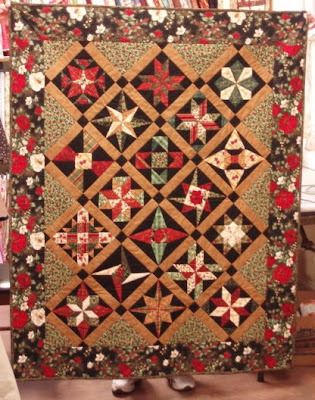 You may remember Judy's quilts from an earlier post. She brought these two beauties to class last Thursday. From hand to machine: Twelve 6-inch finished blocks all done by machine. And, trust me, those points are sharp! Judy hand quilted the blocks and then finished with machine quilting in the borders. Just delightful! Thanks, Judy, for sharing. And, Beth, if you are reading this, we missed you at class. Hurry back! Just got Secretariat and watched it all, movie, extras--everything! Wonderful movie! And a veritable cast of who's who! Some unexpected surprises there. Tomorrow's post I think will include a bit of quilt marking info and a knitting finish! I'm not sure what else yet! So stay tuned! Trying to stay in stitches (literally)! The first finish of 2011! 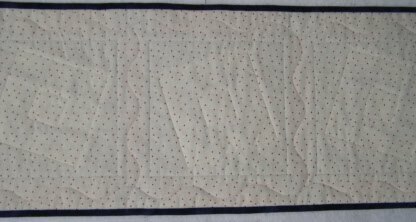 This wallhanging/tablerunner was set into a top on January 29, 2009. It has been on my sewing table, basted, for at least a year. My plans had been, as always, to hand quilt it. But, with reality setting in, I decided on Friday night to try my hand at machine quilting it. Here is a picture of how I baste even for machine quilting. I know those who really machine quilt are falling off their chairs laughing hysterically, but I know my pieces will come out flat if I baste like I do for hand quilting. There is quilting in the ditch in the middle of each block, around the white edge of each block and around the outside (blue) of each block. Then I marked an undulating line in each of the sashing/cornerstone rows. I matched the thread to the fabric I was quilting, except the blue cornerstones--they got red. You will see a bit of the white line still left--I used the Sewline white marking pencil. The marks will come off when I wash the piece. Here's the back. You can see more of the quilting motifs from this side. Saturday morning I trimmed the piece, added a hanging sleeve to a short end, and did the binding, both hand and machine stitching. I decided to add the hanging sleeve because I think this will make an equally good wallhanging for a long, narrow place I like to have a little something. 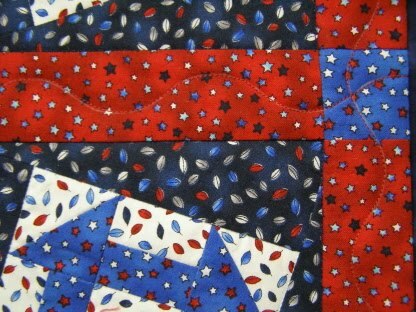 And red, white, and blue will make it great for summer hanging. 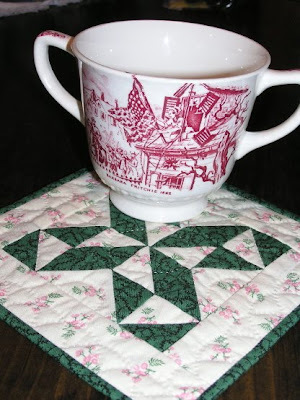 By the way, the little churn dash blocks were set using Sharyn Craig's twist & turn set. Easy to do, great look. Also useful if you have blocks of unequal sizes--the setting makes them all the same size. I finished quilting an applique piece tonight. Hopefully I can get that bound tomorrow. How are the rest of you doing? P.S. I am listening to Savor the Moment by Nora Roberts. Yep, one in a million. Those are the odds of something happening to your flash drive. I, unfortunately, won that lottery. All my pictures and data are gone. Apparently, as things are downloaded onto the flash drive, they are encrypted. So that no one can get on but you! Unfortunately, mine encrypted itself again and no one can get into it at all! I'm still lucky though--it could have been much worse. And I am taking HUGE steps to see that this never happens again. Please do so yourself. And many thanks to all who kept good thoughts for me! It's so ironic that with digital cameras we take many more pictures of things and of things that we might not if we had to develop film. But it is so easy to lose everything to a glitch in technology. So back them up in at least two places--I have so decreed it! Have a wonderful start to your week--hopefully it will include some quilting time. I've been knitting on that second sock. Only 10 more rows to the toe decreases! Happier news next time (I hope!). One large rice buddy, two hand warmer rice buddies and a pillowcase. 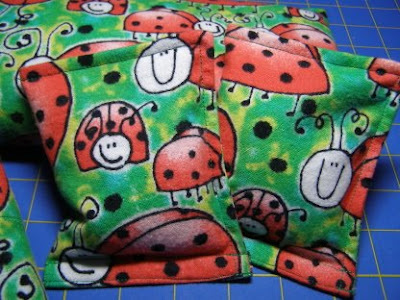 All of flannel with--yep, you guessed it--ladybugs! I have a friend who loves them and does not read the blog, so I am safe in putting them up. 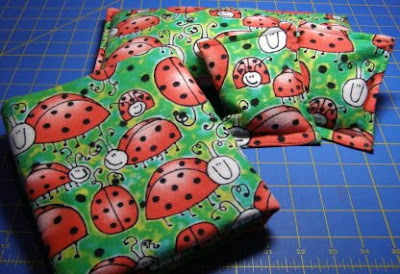 I had to scramble in 2010 because a book I saw with ladybug quilts was not being published until April 2011! Hard to give in 2010. Unfortunately I didn't know about the delay until almost gift-giving time. Not so for 2011. I have sworn to be proactive so that I can enjoy the season more. Somewhere I read that if you buy/make a holiday gift in the month of someone's birthday you will be ahead of the game. And this box idea would also work for birthdays. Would anyone like to join me on this quest? I also have another box with knitted hats for both babies and adults. The adult hats go to people undergoing chemo/radiation as needed. Quick to make, but having an assortment for someone to choose from means a lot to them. I use leftover yarn to make a tassel with the yarn content and washing instructions on it. No guessing for me or the recipient. So I am off to a good start on my Gift Box, with more ideas in mind. As I was looking through some older photos today, I came across this gift I made in 2004--and had forgotten about. Thank goodness for photos! 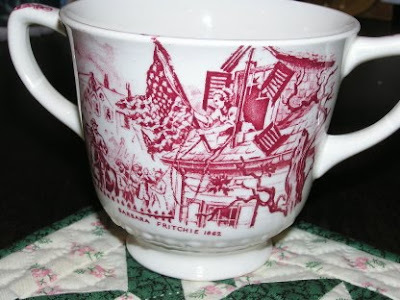 While at an antique/collectibles shop one day, I came across this Barbara Fritchie sugar bowl (at least that's what I think it is). I snatched it up and brought it home. While I toyed briefly with the idea of keeping it, I knew just where it needed to live. Did you know there is a Barbara Fritchie star? What better companion for this lovely piece. A four-inch block with borders and a 1/8 inch binding. Machine pieced and hand quilted. And made with the fabric line designed by the recipient: Anita Shackelford (http://www.anitashackelford.com/). It was fun to revisit this project--I hope Anita got as much pleasure from it as I did. Still no word on the data. And you may have guessed that these pictures were saved other than on that flash drive! Snowy here--about 6 inches total with gusty winds. If the winds die down tomorrow, it will be snowblowing time. Drifts about knee high are enough to warrant that rash act. P.S. Listening to Knit the Season by Kate Jacobs and reading A Deadly Yarn by Maggie Sefton. All the information provided below is my opinion. Like the thread, these are the things I do every day. Use what makes sense to you, feel free to disagree, add comments to open a dialogue with others. Again, I am paid no endorsement fees. Betweens are for hand quilting. The higher the number, the smaller the needle, i.e., 9 is larger than 10 which is larger than 11, etc. Richard Hemming makes large eye needles, which are easier to thread, in both sharps and betweens. John James Sharp Size 11 are my favorite needles for handwork. Remember that one side of the eye is larger than the other; if you are having trouble threading the needle, turn the needle 180 degrees and try again! Sharps are used for woven fabrics like our quilting cottons. Ballpoints are used for knits. Universals are a combination sharp/ballpoint. They do not make as fine a seam on wovens as sharps alone do. Have a featherweight? Stitches kind of zigzagging on their own? Change to a sharp needle and the problem will miraculously disappear. No kidding! My favorite needles? Sharps size 11 or 12 for general sewing. Why? Because a 50 wt. thread adequately fills the holes left by size 11 needles. Have you seen the holes left by larger bore needles? Bet you have--hold a machine quilted quilt up to the light--see those holes? Too large a needle, too fine a thread. 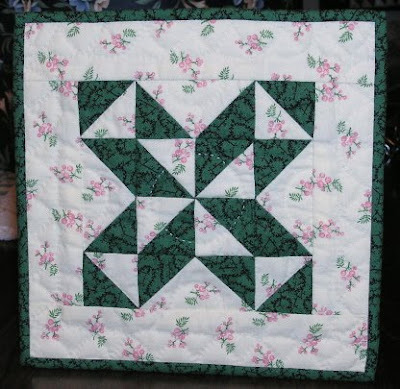 You may need to go to a size 14 or larger for machine quilting when using those heavier threads. Needles should be changed after about 8 hours of sewing. Not just when they break. I am still opposed to silk and polyester or polyester-based threads. 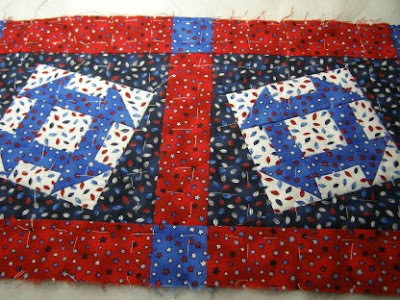 Even if poly is used only for machine quilting, the quilt is still moving and it's still poly against cotton fibers. 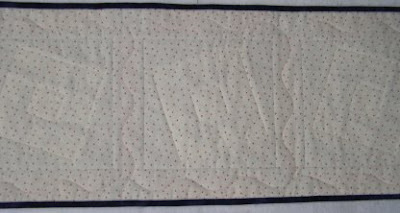 When I first started quilting, a cotton-covered polyester thread was about all that was readily available for quilting. I figured I had the best of both worlds--cotton covering, poly strength. But the poly wears away the cotton coating and then I was once again left with the poly thread against my cotton fibers. Silk? Yes, it is very fine. Hard to keep in the needle. The bad news? Over time, silk thread "relaxes" and allows the applique to pull away from the background. That's why I like the 60 wt. Mettler--all cotton, as fine as silk but much easier to use. So there you have it. Food for thought--or an insomnia aid. Maybe pictures of something tomorrow. P.S. Thanks to all of you for your concern about the potential data loss. Still no word on that yet so keep those good thoughts. For those who suggested Carbonite, which I was fully prepared to do, I have dial-up. The computer techs just shook their heads and said--oh, my. 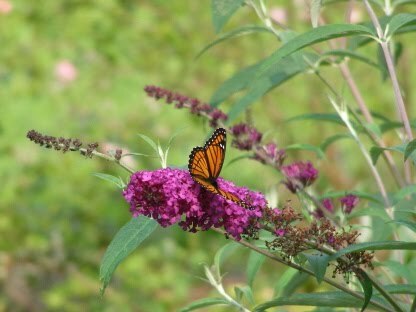 Just as a quick aside, several years ago the computers at the place hosting my website went down--and they lost a great deal of my website content. So...you may want a back-up plan to cyberspace. I now have a web host that backs up every day and on multiple storage devices. Just sayin'. I don't want anyone else going down the roads I've already traveled. Why, oh why, couldn't they have been "the roads not taken". When you least expect it. I had been doing really well with posting every day. Thursday I didn't get home until close to midnight so I decided to wait til Friday. Friday night I started the post, went to pull a document from my flash drive and found it didn't work!!!! Talk about panic!! I tried the drive in my desktop computer--same thing. The computer kept giving me the "please insert disk into drive e." But the disk was in drive e! Today I took the drive to the computer store and found out that Yes, Indeed, the drive had been damaged. How, you ask? Only the Shadow knows, apparently. So, please, if you can keep good thoughts, prayers, crossed fingers--whatever you use for luck--that my data will be able to be recovered. If not, I will lose untold pictures and documents. In the meantime, I have purchased (and installed) a 1 TB external hard drive. I did ask if 1TB was enough--now I am totally paranoid, and I will save some things to the computer hard drive and only do a few things on a flash drive when I need to transport data. This was a hard (and expensive) lesson to learn. I'll keep you posted, but please, please, keep good thoughts for my data to be retrieved. And don't rest until you've backed up all your files in at least two places. I'll try to get back in the swing of posting every day again--needle info is still coming--I just have to type it back into the computer. Don't give up! As a quilt judge, I cannot tell you the number of times I have seen thread exposed in a seam--and that's not a good thing. People may assume that no one will ever see the thread they used on the inside of a finished quilt--they assumed wrong. Many people like to paper piece. And guess what color thread they sometimes pick? WHITE! That's okay if the whole block is light colored (although I so rarely use white thread that I have only one very small spool--other colors are better choices even on lighter colored quilts). But this is often on a black-based quilt. Guess what happens when the paper is removed? That's right, the stitches become looser. Think about it--you sew through the layers of fabric plus a layer of paper. When you remove the paper, the stitches are now looser because they do not have the layer of paper. When the seams are pressed, the stitches can show. Think this advice applies only to paper piecing? Think again. Below are samples I made to illustrate what can happen when the wrong color thread is chosen. 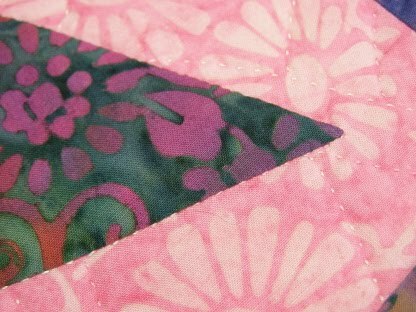 First up is a dark green batik pieced with a light gray thread. See those tiny dots of thread in the seam? The same dark green stitched with white thread. Yes, I do have a death grip on the fabric to show what happens, even if the stitches are balanced. 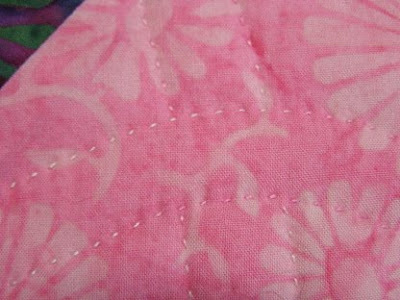 But...I have actually seen people do this to seams on my finished quilts. Do I pay attention to this? You bet. Did I when I was new to quilting? Not always. 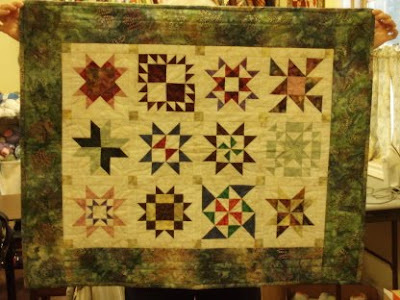 But when I look at those older quilts now, I wish I had known then what I know now. If you can't be a good example, be a horrible warning. I was the latter, now I'm trying to be the former. Here's a black fabric pieced with a white fabric. Think thread color doesn't make a difference here? Proof is in the picture. I pieced this seam with white thread. See the white stitches against the black? If I had used black, you wouldn't have seen the stitches at all. The moral of this story? When choosing thread to piece with, match the darker fabric. I use the same color in the bobbin and in the needle. Do I sometimes have to change threads if the bulk of the quilt is dark but the background is light? Yes. Where the two lights come together I change to the lighter thread. Why? Because the darker thread will shadow in the seam. It's an attention to detail. I use a lot of gray thread in my sewing. Although I have all (yes, I said all) the 50 and 60 wt. Mettler threads, I buy #713 (taupe), #736 (light gray), #724 (medium gray), #758 (dark gray), and black by the box. But I still need the other colors--because if I am making a brown quilt, I need brown thread. Jay said he thought I must have thread hidden elsewhere from what I showed you--the answer is that all my 50 and 60 wt. threads are only in those boxes. My quilting thread is stored elsewhere, mostly by brand and sometimes by weight. We'll visit those another day. Remember on my masthead that it says I am very opinionated. Truth in advertising--I am! Next up: Needles, both hand and machine. P.S. I am listening to Lost Empire by Clive Cussler. Reading a funny book on dressage, which I know you probably don't care about! P.P.S. Hi, Laurie! Hi, Mary Ann! See you soon! P.P.P.S. Janet, I'd be interested in what parts you disagree with! You can email me privately, if you'd like. 100% cotton thread is best for working with cotton fabrics. 40 wt. threads are for quilting (brown). 50 wt. is for all sewing, hand and machine (purple). 60 wt. is for appliqué and embroidery (green). The larger the number, the finer the thread, so if you find threads listed as 12 or 30 wt., they will be very heavy. Using a thread conditioner such as Thread Heaven helps control knotting and tangling. Remember to keep moving the needle toward the free end of the thread every few stitches. It will prevent the thread from wearing and breaking. Thread the needle before cutting the thread; knot the end that came off the spool last. Many spools of thread are labeled for machine quilting; they can also be used for hand quilting. Basting thread is inexpensive and breaks easily. Use it for basting your projects, whether for appliqué or quilting. Polyester-based and silk threads are stronger than the cotton fibers we work with and will, over time, wear holes in our quilts. Cotton-covered polyester does the same thing. When an exact color match is impossible to find, and you are left with one color that is too light and another that is too dark, choose the darker color; it will roll off the spool lighter. For appliqué, match the appliqué fabric as closely as possible. For piecing, match the darker color, or choose a neutral that looks good with all the fabrics. Never choose the lightest fabric to match; the thread will show on everything but that one. Okay, I know there are those of you (and others) who would disagree with any or all of the items on my list. But here's what I know--I've been using this formula for years and I am happy with the results. Rest assured that I do test different brands of threads from time to time, but I really prefer the Mettler. (And, no, they don't give me any endorsement fees.) I thought I would talk about quilting threads in a different post. So there you have it--thread according to me. More to come! 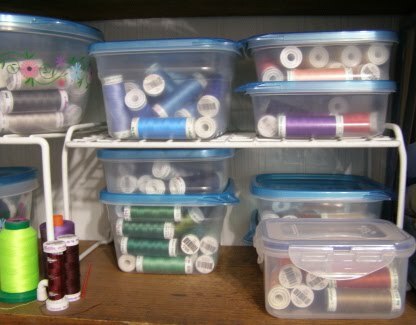 This morning a friend and I were talking about reorganizing our sewing spaces. Doesn't that seem to be the never-ending battle? I told her about how I store my thread and she said I should send it to one of the magazines. I told her I would do one better and put it on the blog! Thread is a major investment. But having the right colors and weights when we need them is crucial. To make it easier for me to find what I need quickly, I sort my threads first by weight, then by color. Below you see the shelf containing my sorted threads. On the left side of the photo are my 50 wt. Mettler cotton threads (I only use cotton). On the right side are my 60 wt. Mettler threads. Because there are fewer colors of the 60 wt., I sometimes combine two colors in one box. These are mostly inexpensive disposable food storage containers. A close-up. See how easy it is to see through the containers to find the right color? And because the weights are separated, I don't have to paw through , say, a green container only to find the perfect shade but in the wrong weight. Once I've pulled the container, I can search under my Ott lights for the right shade to match my fabrics. As an aside, behind the cone holder you can see my used pin jar--almost full! And two chicken pincushions that I have been gifted over the years. I don't feel like such a "cluck" when I do something wrong--they are supposed to be overseeing my work! Hang onto your hats--tomorrow we'll be discussing fiber content of thread, as well as what weight to use where. And don't get me started on what color of thread to use for piecing--I just can't go there tonight. But wait for it--because it's coming. Butterflies stand for a new beginning. How appropriate at the beginning of a new year! I spent most of the day piecing more Black Spruce blocks. Two more tops are done with one more to go. Plus I have a rogue 10th block because the cutting is for two blocks at a time. I plan to do a special set on that one. Second unfinished sock got ten more rows of ribbing. I am half-way! 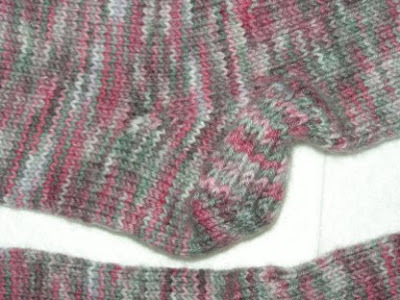 One thing I've found out the hard way is that I don't like to knit a lot of pattern into the top of the sock. It's not relaxing and is not something I can take with me while waiting. 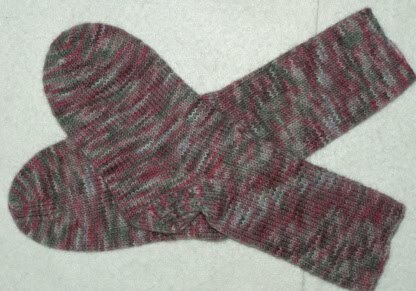 Warning: There may be a post about a completed sock and a started sock that will be reduced to --gasp--yarn once again. I'll document it in all its horror! And then I'll share! Back to teaching this week--but with weather cancellations it's been quite a while since I've seen some of these students. It will be good to see everyone again. That's it for tonight. Hopefully something more exciting will happen for tomorrow's post! 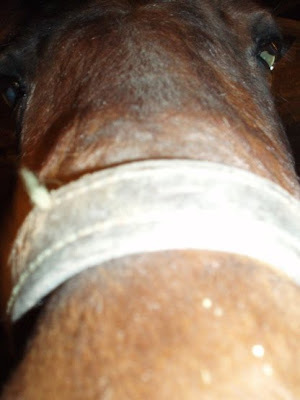 Life is short and we need to remember to horse around more (safely!!) Laughter is good for us and is contagious--so let's spread it around! Did everyone survive New Year's Eve? It was the usual ho-hum here--what a stick in the mud! But a safe stick in the mud--so I can be adventurous the rest of the year!